PIGEON FORGE, TN (CelebrityAccess MediaWire) — In a move designed to bring a taste of Las Vegas to East Tennessee, The Smoky Mountain Opry Theater in Pigeon Forge, Tennessee, has signed nationally known star magician Darren Romeo, ‘the Voice of Magic,’ to a multi-year, multi-million production beginning this March 7th, 2015. 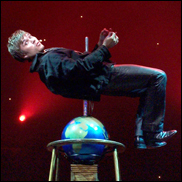 Romeo, a magician and a singer, will bring his critically acclaimed full-scale production ‘Magic Beyond Belief’ to the stage. The new show features white tigers, large-scale original illusions, vocal performances, celebrity impersonations, comedy, and a huge tribute to the magicians who inspired him the most: mentors Siegfried and Roy and Harry Blackstone Jr. In addition to worldwide touring, Romeo starred in his own show as ‘Siegfried & Roy’ presents, Darren Romeo’ at the Mirage Resort Hotel and Casino. He has also performed in Las Vegas at Caesars Palace and the Flamingo Hilton and at the world famous Magic Castle in Hollywood. One of the most awarded magicians in the history of magic, Romeo has garnered an extensive list of accolades including: ‘Magician of the Year’ from the Magic Castle, The Academy of Magical Arts, Inc.; ‘Show of the Year’ (2 years in a row) from the Branson Critic Association and the ‘Milbourne Christopher Award for Notable Contributions to the Art of Magic’ from The Society of American Magicians (SAM). Recognizing the historical importance the ‘Art of Magic’ has had throughout the centuries, Romeo will honor Harry Blackstone Jr.’s legacy by performing his famous ‘Floating Light Bulb’ Illusion – the only magician in the world granted permission from the Blackstone family to perform this full tribute.